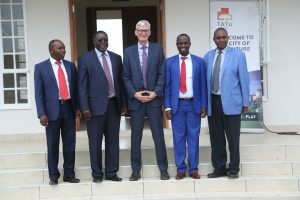 Tatu City, the Vision 2030-endorsed satellite city near Nairobi, has opened a new building dedicated to the Tatu City Training Academy, which provides classroom learning and hands-on practical training to qualify the local community for work in the buoyant construction industry at Tatu City, in Kiambu County and beyond. Since the start of the year, the program has trained three classes from the community living around Tatu City in skills such as masonry, plasterwork and tiling. Further programs are planned to train electricians, plumbers and painters. Over 85% of students graduating from the Tatu City Training Academy have jobs, thanks to their new skills. Tatu City has set a standard for community support in Kiambu Country. All contractors working at the project are required to hire from the local community. At present, around 2,000 workers are currently on-site, employed by Tatu City and contractors building schools, apartments, warehousing and factories. On completion of a six-week course delivered by ArcSkills a leading professional development agency in Kenya, graduates are given certificates validated by the National Construction Authority. Thereafter, Tatu City assists the graduates to secure construction jobs with the contractors on site. The Director General of the National Industrial Training Authority, Paul Kosgei, added his congratulations to the program: “The dynamic teaching methods delivered by ARC Skills are driving a real improvement in skills within the construction industry, and we look forward to seeing more graduates come through the doors of this centre and into regular employment over the coming months,” he said. Over time, the academy is expected to train hundreds of people, with tens of thousands of employment opportunities being provided at the 5,000-acre Tatu City Special Economic Zone. Also attending the event were representatives from the Ministry of Labour, Technical Vocational Education and Training Institutions, Kiambu residents, ARC Skills and alumni from the three cohorts that had previously graduated from Tatu City Training Academy.